I ended up using a circular sourdough loaf from Boudin which was very tasty. I'd be interested to try a french loaf next time, but I'm glad to know the sourdough worked well. Alright, I've talked long enough, let's get into making this garlic magic! Here are the ingredients, ready to go! First we'll cut the bread into sections. Don't cut all the way through! Cut enough to get near the bottom, but still leave the bottom connected together. 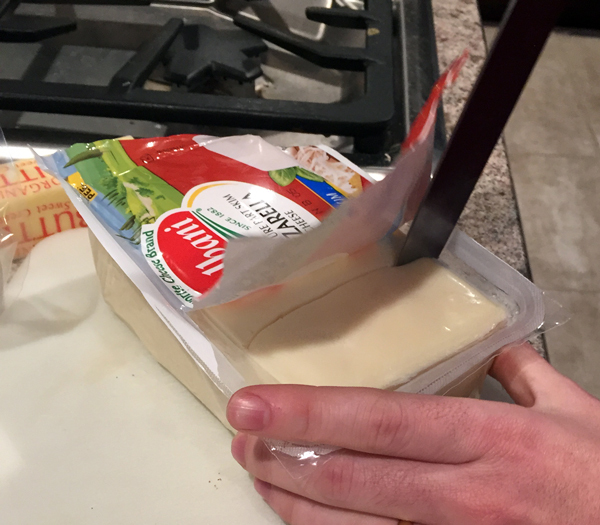 Next we'll prep the mozzarella. I kinda eyeballed how many slices we'd need to fit into all the bread sections. I ended up adding a few more slices to fill everything in. Stick the mozzarella wedges in each section of the bread loaf. Chop up the parsley (I kept it pretty finely chopped), grate the garlic cloves and then the parmesan. Set those aside. Melt your butter in a bowl, add the parsley, garlic and parmesan, and then stir it all together. Take that garlic sauce mixture and spread it into each section. You'll want to work fast so the garlic sauce doesn't seize up as the butter cools. With the sauce added it's now time to get this thing in the oven! Get your parchment paper ready. 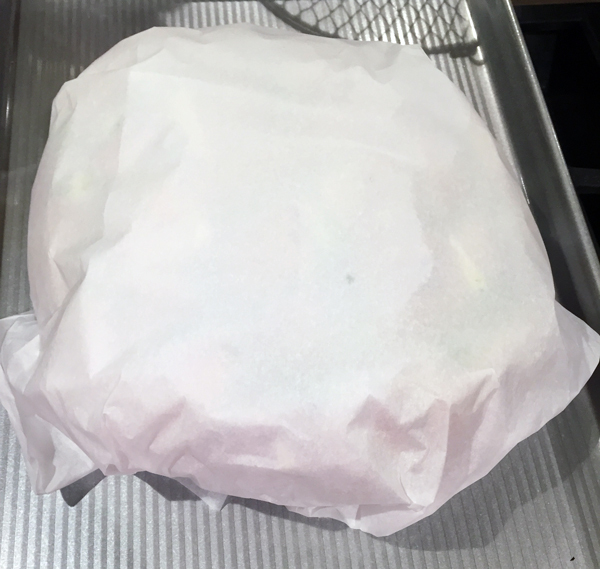 Wrap your bread loaf in some cozy parchment paper and stick it in the oven for 20 minutes! By the end of the 20 minutes your house should be filled with the smell of GARLIC. Amazing! Take your bread loaf out, unwrap it, and ta-da! You have your deliciously cheesy Mozzarella Garlic Bread to enjoy.